At what point will I get it through my head that Rodney is not Previous Horse? Previous Horse was grouchy old coot who had moments of supreme ill-temper. On the night before he died, one of his last acts on earth was to kick me. Therefore, it had always been made extremely clear to him that when the halter was on, he must behave. Stand where he was put. No biting. No kicking. He could bite the air. He could pin his ears. But any illegal action would would result in swift justice. Halter off, all bets off. That didn’t necessarily mean that no halter = hostile horse. If I took the halter off & he wanted to stand around & be fussed on, cool. If he wanted to leave, also cool. Halterless time was his time. Mathilda has a similar routine but the difference is less dramatic in her case. Rodney doesn’t see it that way. 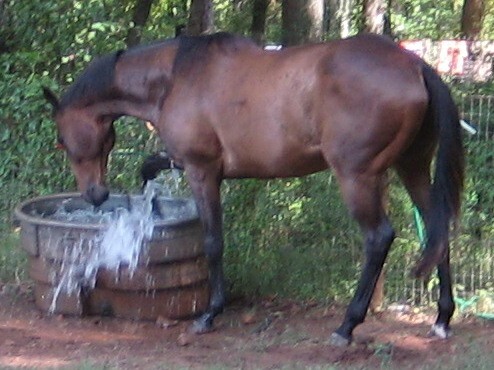 When I catch him for his daily shower, I usually don’t bother with a halter. Just grab him around the nose & lead him up to the water trough. This is the only time I do this with him. We do this every day. Some days he say, ‘Oh goody!’ and saunters along. Other days, he resists as if I am asking him to work. Then he stands quietly and won’t leave until I’m done. He doesn’t interpret no halter as permission to walk off. I think I am being consistent. He thinks I am being confusing. The lines he draws to categorize the world are 90 degrees to the lines I draw. He thinks he is being consistent. I think he is being confusing. No competition, therefore no Red Saddlepad. Instead, I recommend a post by the USDF‘s Olympic blogger about the Dressage jog. She has a USDF Silver Medal, so she’s allowed to call dressage horses fat. Also, note the look on the face of the rider whose horse is acting up. She looks annoyed, but not at all surprised. How long is your new horse adjustment period? Great link to the Dressage jog! My guess is that the eventers jog all the time – for every CCI* and up they jog twice. So, they practice with some degree of frequency. Do the FEI dressage horses have to jog for every FEI test? Not sure, but surely not as often as the eventers.